The size of the esports industry’s monthly audience is on pace to rise from 167 million in 2018 to 276 million in 2022, which would be on par with what National Football League viewership looks like today. More people are already watching esports competitions in aggregate than Major League Baseball and National Hockey League events. The above information is provided by investment bank Goldman Sachs, which is now very much interested in getting involved in the market. It sees lucrative monetization opportunities on the horizon based on the massive audience that is largely comprised of individuals under thirty-five-years-old. It also sees a lot of investment in the space, noting that there has been $3.3 billion of venture capital investment in esports-related startups since 2013 and a 90% year-over-year increase in 2018 from the total amount of funding in 2017. Goldman Sachs views media rights as being the biggest bucket of the esports industry to advance over the next four years. 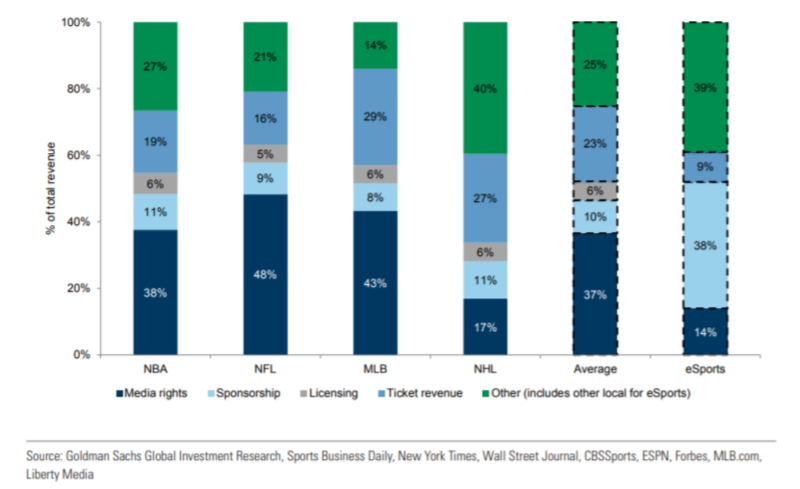 It has found that 14% of the esports industry’s revenue stream came from media rights in 2017 and expects that media rights will grow to cover 40% of the revenue in esports by 2022 — comparable to the average of the NFL, NHL, MLB and National Basketball Association today (37% of revenues from media rights deals). The revenue projection for the esports industry in 2022 is $3 billion, per Goldman Sachs. Thus, a whopping $1.2 billion of that amount is believed to be derived from media rights alone. While Activision has signed an impressive two-year, $90 million deal with Twitch to distribute Overwatch League games in North America, Goldman Sachs sees this as just being the tip of the iceberg in the space. Audience growth will lead to more lucrative media rights deals, and Goldman Sachs says that growing prize pools will help fuel the predicted audience improvement. That trend should continue as player earnings begin to be closer in proximity to wages earned in traditional sports leagues. Goldman Sachs believes that the popular gamer Ninja is now earning approximately $1 million per month, which is an incredible jump from the roughly $500,000 he was earning only eight months ago.